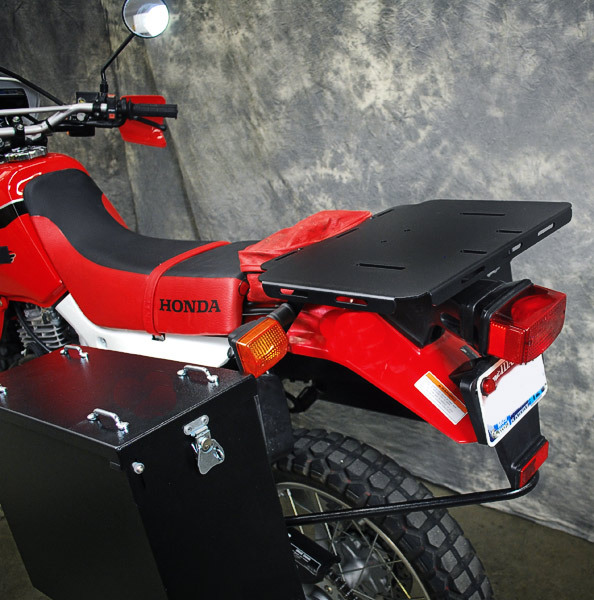 The XR650L Tail Rack is a great addition to your bike's carrying capacity. We bring you exceptional quality in a rack for all your adventure motorcycle needs. Tail rack measure 8.5" x 10.5"
Note: Tail rack is not compatible with a Corbin after market seat at this time. Special: Add our Universal T3 Top Plate on your tubular rack and carry larger items or mount a top box. Offloads fast for trail riding. 16"W x 12" D. Add to your order below for a savings of $24. Will this rack fit on a 1998 model. Yes it will fit a 1998 XR650L.